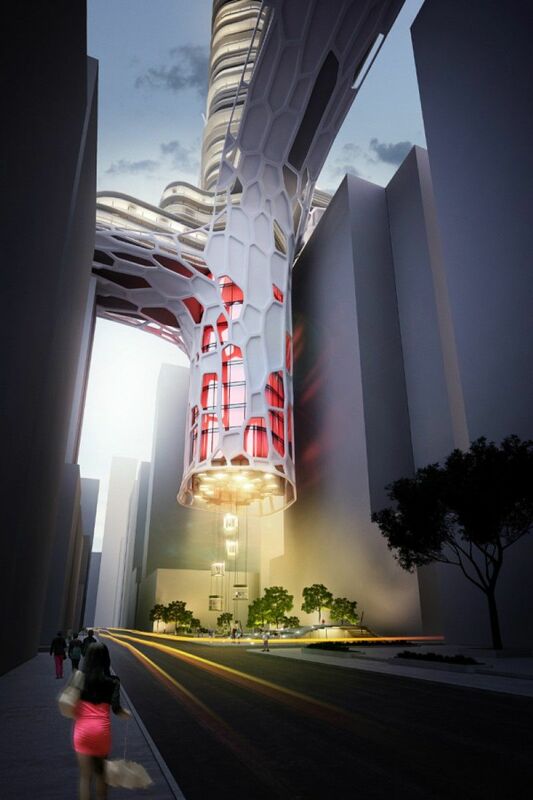 The project by the young architectural studio Urbanplunger has been recently awarded the third prize in the Night Club Hotel in Hong Kong international competition. The main idea is to create a suspended building structure to comply with the extremely compact planning in Hong Kong. The whole structure is elevated above the ground by leaning on the nearby buildings. The nature of the design allows for a green square underneath the building and increases the area of the existing recreation zone. The visual and functional aspects of the building consist of three main parts: 1. Nightclubs. The lowest part of the building. 2. Public mid levels with lobby and security access to the hotel. A Spa centre with a semi-Olympic sized swimming pool along with a business centre, store, restaurant etc. makes up the central part of the building. 3. Hotel. The upper part of the building. All the floor slabs have the same depth and size but the structure tapers inwards towards the top. This allows for balconies in single and double rooms and terraces in suites, aerial villas and the presidential suite. The building is linked to the ground by lifts that go up to the lobby through the nightclub zone which is open to the public. From the lobby customers are able to gain access to the hotel, spa centre etc. The structure is an architectural parasite that leans on its neighboring buildings and uses their internal infrastructure. The entire load of the construction is transferred onto the buildings it leans on via the load-bearing frames that form the “wings” of the building. This allows for the vertical and horizontal structures to be made from light and strong composite materials.